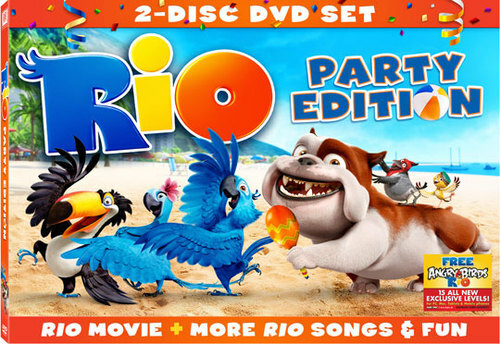 Rio tells the story of Blu, a Spix Macaw who is captured from his native homelands of Brazil at a young age to be domesticated thousand of miles away with his human owner Linda. His new owner soon discovers that he is the last male of his kind, and with that , the two head south to Rio de Janeiro to meet Blu's new mate. However, it is nowhere near close to love at first sight between the socially awkward, flight challenged Blu and the strong and independent extreme flying female Jewel. Shortly after Blu's arrival, greedy animal smugglers capture the two rare birds and they soon find themselves helplessly lost in the Brazilian rainforest. Unexpectedly thrown together they embark on a hysterical and endearing adventure where they learn about friendship, love, courage and spreading ones wings to fly. 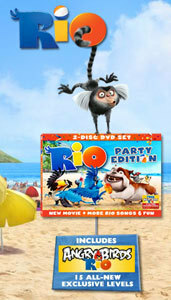 The creators of ICE AGE bring audiences a whole new tropical adventure in RIO featuring the most colorful cast of characters south of the Equator, including George Lopez, Tracy Morgan, Jemaine Clement, Rodrigo Santoro, will.i.am, Jamie Foxx, Jane Lynch, & Wanda Sykes. More Music! More Dancing! More Fun! Available on Blu-ray and DVD August 2nd!